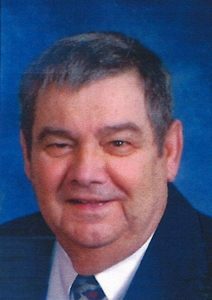 Marvin J. Ziegler, 80, of Russell, Kansas, died on Wednesday, August 08, 2018, at the Wheatland Nursing Center in Russell. Marvin was born on July 10, 1938, in Collyer, Kansas, the son of Leo J. and Celestina (Wildeman) Ziegler. He grew up in Collyer, Kansas, and graduated from Collyer High School and attended Ft. Hays State University. He met, fell in love and was united in marriage to Helga Fecher on June 11, 1966, in Hays, Kansas. From this union they were blessed with 3 children Michael, Ramona & Michaela. Marvin worked as an insurance salesman for Mutual of Omaha, later he went out on his own and became an independent insurance agent. He also owned the Daylight Donut Shop and Daus Essen Haus. He also worked as a realtor and worked for the Russell County Sheriff’s office in the Russell County Jail. He was a longtime member of St. Mary Queen of Angels Catholic Church in Russell. He worked at the church as a CCD teacher for 17 years and was a church lector since 1978. His primary passion was working and promoting the Knights of Columbus and was a 3rd and 4th degree knight and was a former Knights of Columbus Color Guard Commander. He enjoyed working in the yard, gardening, all kinds of sports and coaching youth sports. Most of all he enjoyed spending time with his family. Surviving family include his wife Helga of the home, son Michael Ziegler (Bethany) of Wichita, Kansas, daughter Ramona McKay of Lubbock, Texas and daughter Michaela Hammond (Bradley) of Skiatook, Oklahoma; brothers Robert Ziegler (Deanna) of Lawton, Oklahoma, Wilfred Ziegler (Ann) of Youngstown, New York, David Ziegler (Marianna) of Kemp, Texas and Louis Ziegler (Margaret) of Collyer, Kansas; sisters Eileen Schmidt of Santa Anna, California and Leona Grippin of Flagstaff, Arizona and 4 grandkids Matthew, Marty, Tyler & Jack. He was preceded in death by his parents. A celebration of the funeral mass will be held at 10:30 A.M. on Saturday, August 11, 2018, at St. Mary Queen of Angels Catholic Church. The Rosary will be performed at 10 A.M. on Saturday at the church prior to the funeral mass. Visitation will be from Noon to 8 P.M. on Friday, August 10, 2018, at the mortuary with the family greeting guests from 6 P.M. to 7 P.M. Friday evening. Memorials may be given to St. Mary Queen of Angels Catholic Church or Knights of Columbus and can be sent to the mortuary. Pohlman-Varner-Peeler Mortuary of Russell, Kansas is in charge of the funeral service arrangements.